wadi rayan the Bedouin believe Wadi Rayan was named after a king who is buried with all his gold and riches somewhere in the Wadi, a myth similar to the Qarun myth of nearby Fayoum,This has made Wadi Rayan the object of scores of treasure hunters. Arab historians credit the name to that of a pharaoh during the time of Joseph. Known to be occupied during Roman times, Wadi Rayan has had a constant stream of modern visitors, including Cailliaud in 1819, Letorzec in 1820, Belzoni in 1824, J . J. Rifaud 1824, Wilkinson in 1840, Schweinfurth in 1886, Steindorff in 1900, and Fakhry in 1942 and 1944. During the British occupation of Wadi Rayyan, Sir Cope Whitehouse, an American, suggested it as an ideal place for a reservoir. To this end a British officer named Colonel Western was sent to explore the area. It had been examined by Sir William Willcox when he was evaluating the irrigation resources of Egypt before settling on Aswan as the site to build the Aswan Dam. was shelved for many years, and it Wai not until 1966 that the idea of creating a water reservoir at Wadi Rayyan became a reality. Today Wadi Rayyan has been transformed from dry desert with a few springs into a fertile valley for agriculture, industry, and toluism. Through the efforts ofthe Ministry of Agriculture and Land Reclamation, 15,000 feddans of desert are destined to be converted into productive agricultural land. Geography and Geology Wadi Rayyan is a depression in its own right, separated from the F ayoum by a limestone ridge. The depression is 42 meters (134 ft) below sea level and covers 673 sq km (260 sq miles), with a 30-meter (96-ft) thick limestone floor. which is really to the west of the Wadi. The diverted drainage water from the Fayoum, fed into Wadi Rayan by underground pipes, has created two deep-blue lakes, one after another from north to south. The lakes have been well stocked with fish, and a small but growing fishing industry is beginning 88 part of the development of the area. The lakes have attracted wildlife, especially birds. The western shore has become the major access area to Wadi Rayan. A new paved road makes access easy and small arrow signs announce all the important sites, including the waterfall. Covering 1,759 km (1,093 miles) along the western edge of the Fayoum, the WRPA, Established rn 1989, now receives 150,000 visitors each year. in the a 1 Gd States An NGO (non-govemmental organization) has been established to create museum along the southern shore of Lake Qarrui to celebrate the Fayoum s archaeologi1cal and geological artifacts There are a lot of thou shall nots listed for the Protected Area . There rs no hunting (lllcludrng firewood) and grazing no damaging or collecting fossils or geological forma t10ns no activity that modriies the natural landscape no discharging of liquid or solid Waste no driving outside the demarcated tracks or walking outside the demarcated area U0 using sound systems or any other source of disturbance and no lighting tires outside merit of OSlflS, 3 Village Wllese here and Walling to be fouled, including, damaging, or disturbing wildlife; no damaging or collecting vegetation designated areas. In addition, there is no mining or quarrying without EEAA authoriza- tion; no building permanent or semi-pennanent structures or infrastructures, including roads, without EEAA authorization; no using an engine-powered boat on the lakes; and ‘ no building a structure closer than 200 meters (656 ft) from the lake edge. Whew! HOW did it survive for millions of years without being thus protected? The regulatory pages do not specify whether the Fayoumis are exempted from some of these restrictions. After all, it is their home, isn’t it? This zone skirts the westem side of both lakes and covers 49.5 km (31 miles). Eco-tourism and environmental education is permitted in Zone C. This zone includes a visitor center, tracks, birdwatching blinds, safari camps, cafeterias, and camping sites. restrictions for this zone are: no additional infrastructure except for educational and ecotourism purposes; no floating structures; and no commercial fishing within 150 meters (492 ft) of the edge of the lake. The Protected Area has one campsite, a visitor center, six cafeterias, one safari camp, and exits. Two ecotourism facilities are planned. The waterfall sits between the two lakes. The entrance is well marked along the main road. Access is for everyone. Once the domain of explorers and rally drivers, the area has been transformed into a not-so- pretty day-trip from Cairo. are available for tours around the lake. The route over the top of the waterfall, once the joy of travelers, has been closed. There are three hills along the lakeshore. 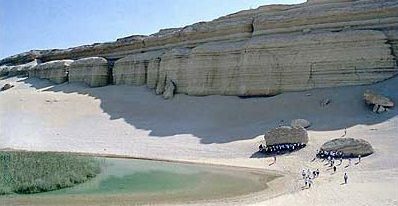 Seven km (4 miles) south of the waterfall, along the lefi, or eastem, side of the road, is a ictures ue area known by the name , P fl of the hill at its entrance, al-Mudawara, the Lookout. In addition to being 21 favorite picnic area, the area is on the migratory path of birds often seen resting there, while resident birds use the area for nesting and birthing. Gebel al-Deir, Mountain of the MonaStefY» looms almost dead ahead and on the right, Of west, side of the road. Dunes, similar’ 10 those at Gilf Kebir, attempt to climb its Side just before one rounds the eastem edge of the mountain. It is worth stopping to look at this marvel as it illustrates the power of dur16S- Even mormtains- cannot not stop them. Gebel al-Deir separates Wadi Rayyan from the deep desert and on its far side is Maglc Spring and the Wadi Rayyan Monastery. The spring area is in Zone A, a strict natural zone that covers 73.9 km (46 miles). In addition to the general ‘thou shall nots’ of the Protected Area, there are additional 1-gsuictions specific to Zone A. They are: Public access is prohibited except for scientific activities with written authorization fi-om NCS. No agriculture or livestock is permitted. That means stay out! !! Of course the monks of the Coptic monastery have not been denied their home, but they have been restricted too. covers 53.33 km (33 miles) and conserves flora and fauna mound the natural springs near the only monastery in Wadi Rayyan. You may see gazelle, fennec fox, and Egyptian golden jackal in the area. do not have the free access that existed here since the beginning of time. park your car and you walk. Yes, walk. That leaves out handicapped and older travelers. You are further restricted to viewing a single spring and obeying additional rules specific to this area: if you do not want to view wildlife and landscapes your access is prohibited. If you want to do scientific activities you must get written authorization from NCS. No boats except for pre-approved scientific activities. Double whew! !Rowayan Area is north of the spring area and covers 20.57 km (13 miles). =mdN 2914 209 E 3018 640 and N 2916 232 E 30 21 640. Gazelle are the main fea-(UIC here. What distinguishes Rowayan from the Springs is that the former lies north °f Gebel al-Deir and the latter lies south. Almost immediately after tuming into U16 desert, the scrub- and dune-studded Wadi that forms the entrance to Rayyan 5031 the deep desert comes into view. It Siuns one, as one does not expect all the Vegetation. At the edge of the mountain, the Spectacular dune knifes its way from the valley Hoof to the summit. The scrubhas many medicinal plants used by the Bedouin, who often came here with their Camels and goats to graze and collect the herbs. Under the current restrictions the Bedouin are out of luck-as they were when the British created a monopoly on salt. There are four springs here: the northem spring is Ain al- Bahariya, or Ain al-Mongar (after the nearby mountain); the middle one is Ain al-Wastaniya; the southem spring is Ain al-Qiblyia, or Umm al-Rayyan, Mother of Rayyan; and the eastern spring is Ain al- Sharqiya. Ain al-Wastaniya is called Magic Spring by modem Bedouin, who follow the centuries-old practice of clapping their hands or shouting. When they do that, the water emanating from the source slowly begins to jump, or dance, to the rhythm of the clapping. The Monastery of Wadi Rayan sits on one mountain. On the far side of the second mountain, directly across the wadi, is the Monastery of St. Samuel. In October 1960, a group of Coptic monks led by Father Matta al-Maskin inhabited the caves in Wadi Rayan and began to live as the desert fathers had centuries before. Sustained by a camel caravan from Gharaq Sultani in the Fayoum, these monks, all university graduates, lived alone in ten individual caves, meeting once a week for prayers. began to dry up, the monks were forced to abandon their monastery. Then, in 1998, a small group of monks retumed to the wadi and rebuilt the monastery. Fourteen desert fathers live there today in harmony with their surroundings. As one approaches the monastery, it looks new. But the work of the 1960s is in front of the old hand-hewn caves. There is even an old oven, or forn, where the monks baked their bread. The desert fathers have agreed to the restrictions placed on their home by the Protected Area. These include restricting the number of monks to around nine, limiting the number of used caves to twenty, and controlling the amount of land used for agriculture. They are monitored.